This month I’m still busy as ever due to work but I want to try out another blog game lol~ XDD It was a ‘lighted bulb’ moment while commuting to work two days ago. 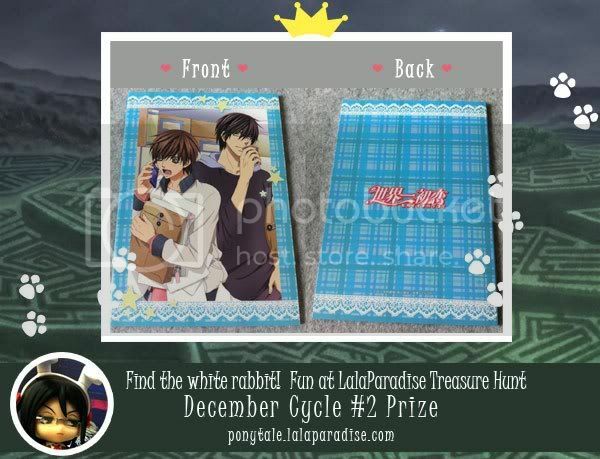 Ten clues will point to ONE “White Rabbit Treasure Post” on LalaParadise. (Well, not exactly the real ‘White Rabbit’ but I’m sure you get the general idea ^^;;). I will post ONE clue each day for 10 days on my Twitter account @lalaparadise. At anytime, you can visit my public Twitter page to see all the compiled clues, so it’s ok if you don’t have a Twitter account. Stating the country is for the purpose of the bonus mystery prize and email is so that I can contact you if you win. To ensure that your comment entry will not be “copied” by others, all entries will be put on moderation mode so only I can see it from my end. I will only reveal the winner’s entry (sensitive info removed) at the end of the cycle. Protect your privacy. The clues will include content that can be found on the winning “White Rabbit Treasure Post“. For example, a cropped pic of a photo, characters mentioned, description, category it belongs to, etc etc. I believe it should be relatively easy to guess. There will be one winner per 10-day cycle. The game will run twice per month, meaning there are TWENTY clues, TWO treasure posts to locate and TWO winners per month. If there is more than one player with the correct post, ONE winner will be picked randomly from the pool of entries per cycle. Prizes will probably vary each cycle. Results will be published on 2 January 2011. Good Luck!